Tonight a few of the Friends from Hither Green Triangle along with representatives from the Council, Network Rail and Morgan Sindall Colas Rail JV will be heading to Westminster to see if they have won a Network Rail Partnership Award. They have been shortlisted in the Community Engagement category along with Atkins for their ‘East Kent resignalling phase 3’ and Signalling Solutions Ltd for ‘Bletchley remodelling’. The completed steps with NR and Morgan Sindall. A lot of people put in a lot of hard work to get this project complete, so we are very pleased that all their efforts have been recognised in this way. Set up in October 2008, the project at Hither Green Triangle was the first Network Rail community scheme in London. Projects (based on our Management Plan) have included habitat creation and improving the visibility of the site from the platform. 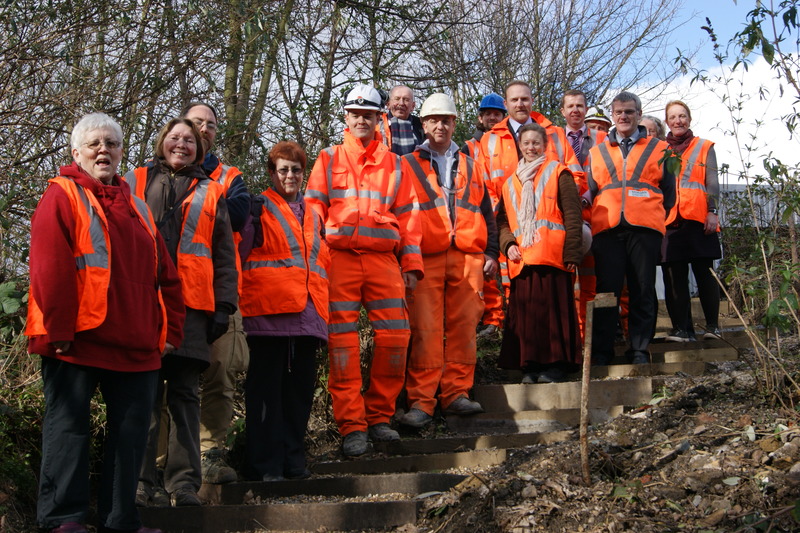 Due to the complications of accessing the site via the Network Rail depot, organising workdays took a great deal of effort and commitment from the Friends, Council and NR. Now, thanks to NR and Morgan Sindall Colas Rail JV the group has a more suitable and accessible entrance which has allowed us to become more independent of Network Rail, whilst still maintaining our close and good working relationship. They now have a renewed vigour and new people are showing interest and joining our group.